A pencil sketch by Claude Buckle of this very fine castle. 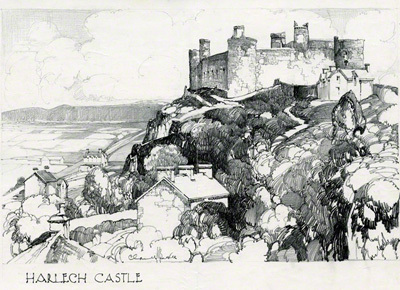 The picture was made to advertise the destination which is served by a main line station at Harlech. Harlech Castle, located in Harlech, Gwynedd, Wales, is a medieval fortification, constructed atop a spur of rock close to the Irish Sea. It was built by Edward I during his invasion of Wales between 1282 and 1289 at the substantial cost of £8,190. Created in 1933.